Day 1: Sunday April 12, 2015 – Day of Departure. Excited boys… Ready for a holiday! 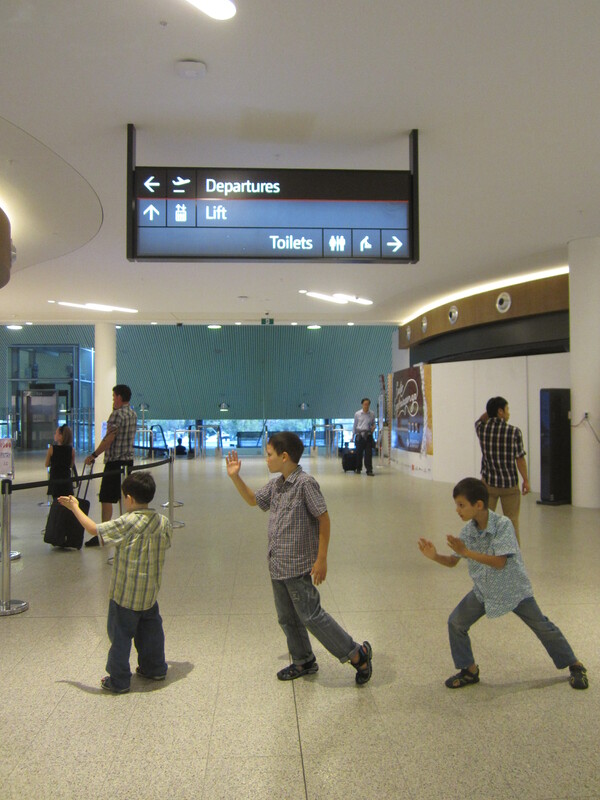 By the time our family arrived to drop us at the airport, we were ready and champing-at-the-bit to get going. Perth International Airport is undergoing a huge change as are the transit routes to it, so it was detours all the way. Luckily check-in went smoothly, as we only had carry on luggage. One precious window seat. This was the lightest we have travelled with a family in tow. One cabin size roll case, one smaller roll duffel, one 30 ltr backpack, one daypack and my purse. All well under weight and easily carried by two adults, if need be. Having soft packing cells for the boys and ourselves is a great help. For most of our backpacking years it had been plastic bags but we have now made the transition. Having everything in a soft compartment means that things stay neat but are still flexible when compressing or squashing down. It also means when kids pull out things not everything gets messed up at the same time. The brief frenzy of check-in done, we sat to wait at a cafe and noted their cardboard tubing masquerading as decor. Graham took the boys to the viewing deck. Then a last mental check that everything is in place. Yes: exact US dollars for our indonesian visas. Yes: details of our couchsurfing host in Singapore. Check: accommodation at Lake Toba booked. Yes: Couchsurfing in Medan and volunteering in Bukit Lawang arranged. Yes: Meet up with local SG family on 25th, locked in. Yes: travel insurance in place. Yes: we were ready to board our first Boeing 787 Dreamliner. This way to another adventure. As we waited to board, the boys read the plane’s name: Dream Start. I don’t know when this small travel dream had started exactly but memories stirred. Neither Graham nor Prunella were enticed by Australia’s favourite holiday home, Bali. They were of the very few people they knew who hadn’t been to this popular tourist playground. (Of course it is inevitable that we’d go there one day in the future…). But the thought of visiting Sumatra and seeing the fabled Lake Toba appealed to our sense of adventure. What a great first venture into all the wonders that are Indonesia! So slowly a seed was planted, plans were hatched and now we were here at Dream Start. 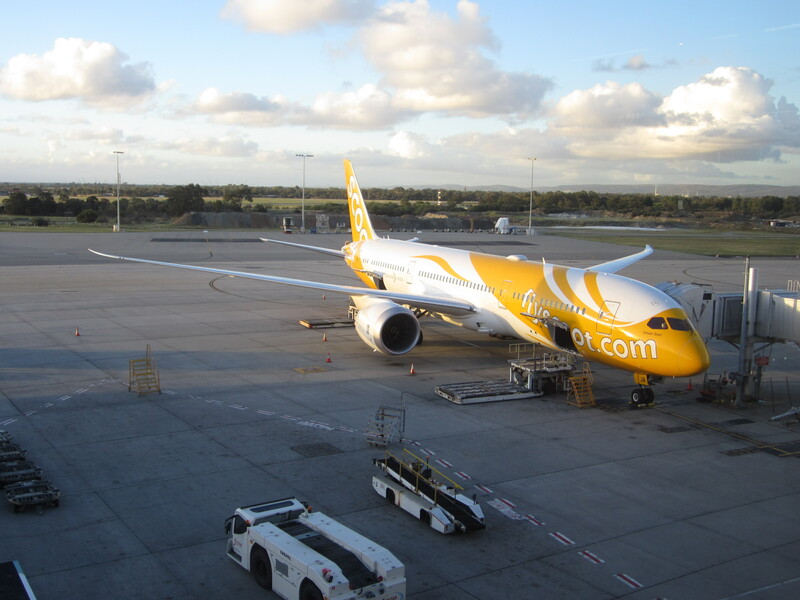 Scoot, a low-cost franchise of Singapore Airlines, have recently joined the growing list of airlines who are pressing the new Boeing model into service. There outside in the setting autumn sun sits the new bird, only weeks from the factory. 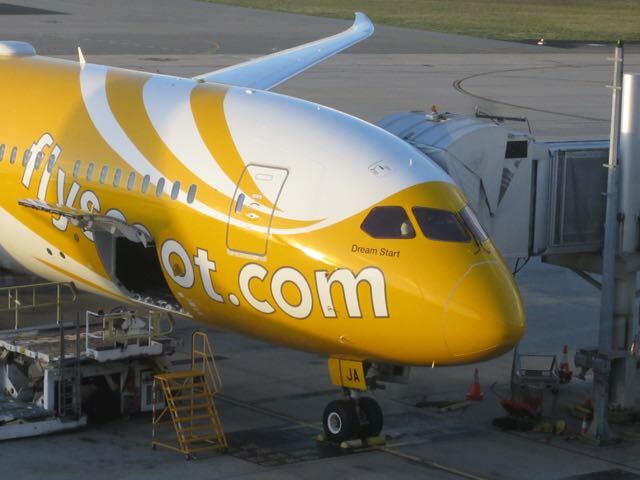 This is also the start of Scoots dream to purchase an all Dreamliner fleet. We hoiked our bags aboard found our seat – which turned out to be the only window seat row in economy without one of the funky oversized electronically dimmable windows which are part of the Dreamliner experience. Oh, a window seat with no window – c’est la vie. The first of the fleet! 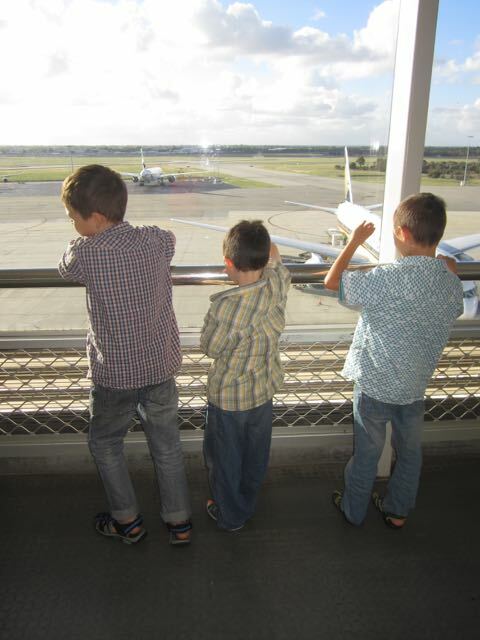 As we sat in the plane and the engines began to roar, there was premature chatter of “we are off the ground!” as three boys wave good-bye to Perth and set off on yet another family adventure. And so passed the hours as we enjoyed the flight. Munching on a covert selection of snacks and cold home-made quiche brought on board in defiance of the stern wet lettuce emblazoned on the ticket: No Outside Food Permitted (we want to sell you a $15 sandwich). Despite being placed in the dreaded ‘family zone’ at the rear of the aircraft, with several groups around us wrestling with overtired youngsters (we’re cool with that – we’ve had those same trips and no-one is having a worse time than those parents – it’s strangely comforting to be able to simply tune it out), our boys settled and slept in a way that adults in any part of low-cost economy class simply cannot. 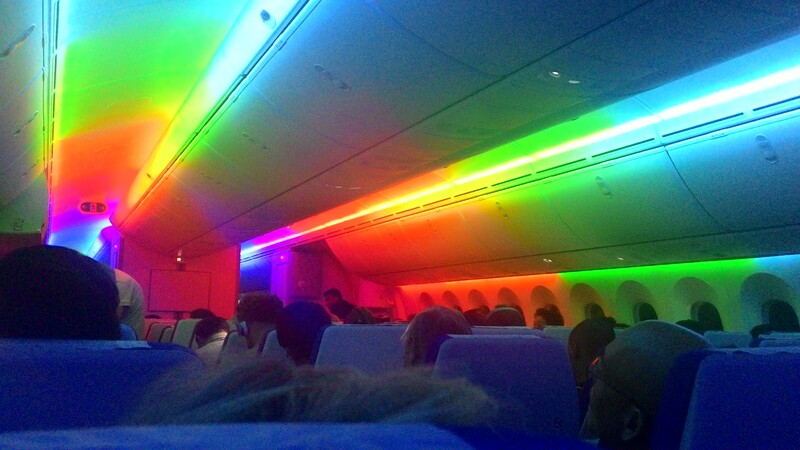 It did leave us awake to witness the rainbow lights gimmick of the airline, and appreciate the new (and noticeably improved) version of canned air on the Dreamliner. Out of the plane, Singapore cash out, into taxi queue, into taxi, dropped at our couchsurfing host’s address. A bit of a tricky propostion as this destination has a same named; street, a lane and a close. A tom tom check by the driver finally takes us to the correct one. It’s midnight, and even in the restless megalopolis that is Singapore, there’s no response to our knocks. Shall we buy a sim card to call? Luckily a man at the restaurant down the road saves us and calls. Yes, says Jake and soon there he is (in-the-flesh after so many emails) – all smiles. We tip-toe past the other adjoining appartments and, after an introductory chat, he leaves us the run of his small, one room, Baliester apartment. We gratefully close our eyes as the boys notice the lego pirates that peer from nooks and cranies. Morning falls as we sleep, now in Singapore. Ya! You’re back on the road, I’ll have some interesting tales of adventure to read and have tempt me again! Excited for you all! Love the ninja like poses sprinting towards adventure! Have fun exploring. Pleased to be having new adventures and blogging about them, Bron.